More impressions of Philadelphia’s Citizens Bank Park (aka Taxpayer Stadium II). 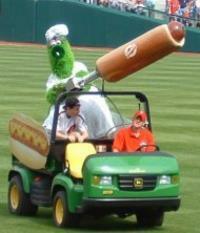 Hot dog gun: malfunctioned, firing a weiner into right field during the game. Seats: still too close together. Bathrooms: clean (before the game, anyway); a stadium employee was directing stall traffic, which helped the line move quickly. Beer: where is the Hop Devil? Harry the K’s (restaurant built into the left field scoreboard): as expensive as we expected, but a fun place to eat dinner and watch the players warm up. The “Memory Lane” history display (a.k.a. “Nightmare Alley”) is literally within spitting distance of visitors’ bullpen. By game five, it was blocked off. I hope that creature is a team mascot and not a food vendor. I’d be very cautious about touching a wiener produced by someone covered in green fur.